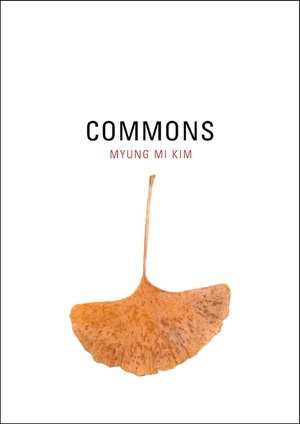 Myung Mi Kim's Commons weighs on the most sensitive of scales the minute grains of daily life in both peace and war, registering as very few works of literature have done our common burden of being subject to history. Abstracting colonization, war, immigration, disease, and first-language loss until only sparse phrases remain, Kim takes on the anguish and displacement of those whose lives are embedded in history. Kim's blank spaces are loaded silences: openings through which readers enter the text and find their way. These silences reveal gaps in memory and articulate experiences that will not translate into language at all. Her words retrieve the past in much the same way the human mind does: an image sparks another image, a scent, the sound of bombs, or conversation. These silences and pauses give the poems their structure. Commons's fragmented lyric pushes the reader to question the construction of the poem. Identity surfaces, sinks back, then rises again. On this shifting ground, Kim creates meaning through juxtaposed fragments. Her verse, with its stops and starts, its austere yet rich images, offers splinters of testimony and objection. It negotiates a constantly changing world, scavenging through scraps of experience, spaces around words, and remnants of emotion for a language that enfolds the enormity of what we cannot express. Myung Mi Kim is Professor of Creative Writing at San Francisco State University. Her three previous books of poetry are Under Flag, winner of the 1991 Multicultural Publishers Book Award, The Bounty (1996), and Dura (1998).